Best Sailing Books for Women! Sailing Books on Women Who Conquer the world! Top of my list of the best sailing books; my first one on sailing women who are inspirational was on Kay Cottee for me she is number one! I had never sailed, not even thought about it until I read 'First Lady" the amazing story of her voyage around the world. This is one of my favourite sailing books because it is inspirational, some parts of my book are dog eared and marked from constant reading; it smells boatie and has a bit of mildew on some pages from being on the bookshelf on my yacht. Parts are so thrilling as Kay battles knock down after knock down in mountainous seas and 75 knot winds near Cape of Good Hope, and if that’s not enough a near collision. And then she entered in her log: ‘Who needs fingernails anyway? You’ve only got to keep cleaning them!’ And then, ‘Yep, definitely emergency brandy situation but saved a bit. And then she’d talk to her Teddy and bake a loaf of bread, even do some knitting. What an amazing lady; sailing women the inspirational.... you bet!! This is a woman who had a dream from the time she stepped on her aunt’s yacht at the age of four. Her story is an amazing journey of an all-consuming passion and dedication to the sea and sailing. 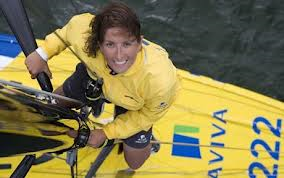 At 18 she was without a doubt inspirational sailing her own 21ft yacht solo around Britain. A few years later she sailed the Mini Transat solo transatlantic race which led to the fulfilment of her dream of sailing in the Vendee Globe. I love reading some of her quotes about her experiences ... they inspire ... they give you goose bumps! “For most, the Vendee Globe is the ultimate race in single handed sailing ....................... it pushes sailors to their very limits, mentally and physically and tests every skill they have on the water." Ellen leaves the very best in awe! Ellen is truly one of the elite when you talk about sailing women who are inspirational!! Put 'Taking on the World' by Ellen MacArthur on your list of best sailing books too! At just 16 years old Jessica Watson became the youngest person to sail none stop and unassisted around the world on Ella’s Pink Lady. She had some major challenges along the way and a lot of critics but for most of us she wasn’t the only one tearful when she returned home to a massive welcome at Sydney Harbour escorted by a huge flotilla of boats, helicopters, cheering spectators in pink, and three television commercial networks. Australia’s prime minister was there to greet her ... In his speech he said; “At 16 years old you are a hero to all young Australians. You are also a hero to all young Australian women. You do our nation proud." "Jessica today you have done just that. Today you have lived your dream." Her answer to that was ...."I don't consider myself a hero, I'm just an ordinary girl," Jessica adding that you didn't have to be someone special to achieve great things. Add her book to your best sailing books list it is out NOW ... on her amazing voyage...'True Spirit' ....you will enjoy it! Meanwhile that is Jessie Martin pictured with her the youngest guy to do the same voyage in his sail boat and his book Lion Heart is great reading and on my shelf amongst my best sailing books. How many best sailing books can you have, a whole collection I guess they are all different!! 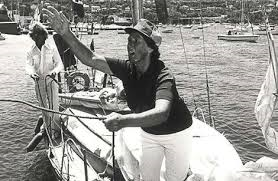 Ann Gash was always an adventurous woman and did not start sailing until she was 45 years old. She learnt coastal and celestial navigation as well as seamanship to handle her yacht Ilimo a 7.3m wooden Folkboat. In 1975 at 65 years old, and a grandmother she set sail out of Pittwater on an around the world voyage in a tiny sail boat. Known as the “Sailing Granny” she returned two and a half years later to a hero’s welcome. Ann Gash wrote one of the best sailing books of her voyage in which she described her adventures, battling storms, being surrounded by a school of sharks, nearly being run down by a tanker and hit by a tug. Sadly she died at the age of 83 after a life of adventure. And if you enjoy this read about another lady Jeanne Socrates at 70 years old who become the oldest women sailor to sail round the world non stop and unassisted. Samantha is one of the worlds leading solo sailors in a male dominated sport! Despite tackling perilous seas and hauling sails twice her weight, Sam still indulges in all things girlie! Sam is a 33 year old Cambridge engineering graduate who still loves all things girlie and can be found at times pottering around on her pink sailing boat, Roxy, in a little pink bikini. She really is a girlie, girlie sailor... crazy about fashion and was known to be dancing in the middle of icebergs to the sound of 'Girls Just Wanna have Fun' by Cindy Lauper. Sam was brought up living aboard a yacht off Hayling Island in England with her parents and sister, and one of her grandfathers was a submarine commander and the other a powerboat racer pilot. 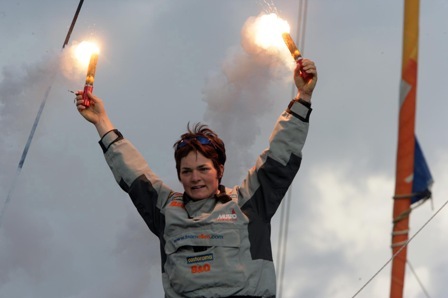 Along with Ellen MacArthur, Sam is in the top five female sailors in Europe. 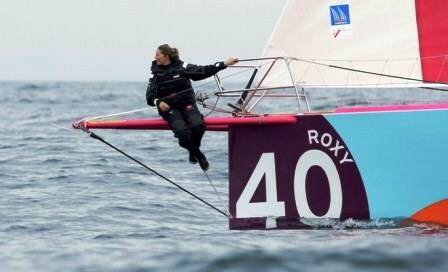 She was coached by sailings Big Three ….. Ellen MacArthur, Shirley Robertson and Tracy Edwards. Guys verses Girls in the sailing world???? Sam says, “Patience and endurance, great female attributes, are also a big advantage. Another of my best sailing books! While you’re getting a library together on best sailing books on women sailors make sure you include ‘Against the Flow!’ written about another inspirational and record breaking British round the world yachtswomen. 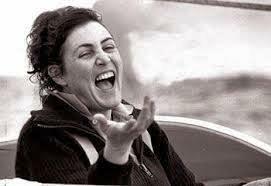 Dee Cafferi, 35, in 2006 became the first women to circumnavigate the world the ‘wrong way,’ East to West, against the prevailing wind and tide. 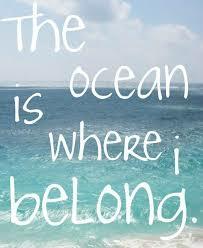 The voyage took 178 days. Dee has been described as a chatty unpretentious PE teacher, which she was until swapping netball hoops for spinnakers just over eight years ago. Just as crucially as learning how to sail her 60ft yacht Aviva, solo round the world in the Vendee Globe, Dee knows the importance of preparing mind and body and has explored the cutting-edge science of navigating her mind and body through unheralded challenges on the vast and lonely ocean! Having more knowledge about my brain and how it reacts will get me on a more even keel emotionally. It takes energy if I’m upset!” Read this inspirational sailing women’s story in another of my best sailing books selection. Dare to Dream is a gift book with 96 pages of inspirational quotes accompanied by 51 world class images! You can see some of these quotes and images on ‘Sea Quotes.’ It takes you on a journey of dreaming, visualizing, setting your goals and living your dream! A fantastic gift and coffee table book!